If you’ve been reading this blog for a few years than you already know how much I adore beets. They are in fact my “spirit vegetable.” They can be a pain to harvest ( especially if you’re hauling hundreds of pounds to the farm stand–which we often did working on Hutchins Farm back east) but aside from the back breaking work I still adore this rustic root. 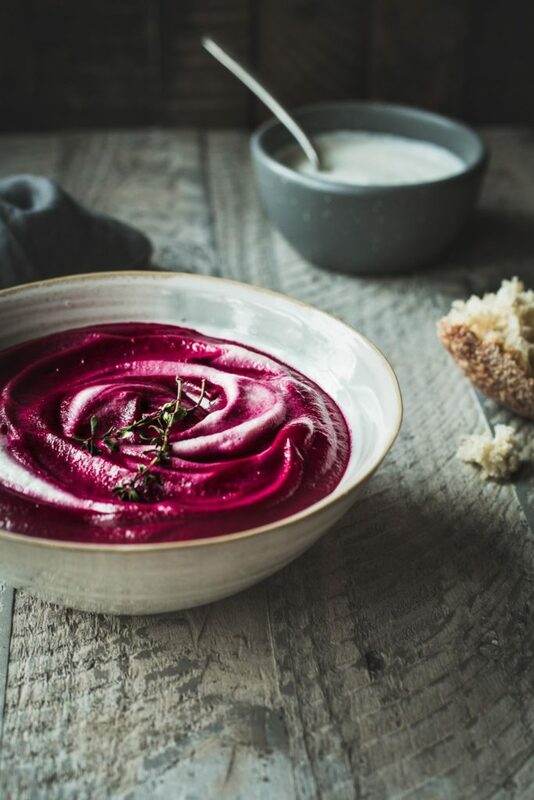 I love all varieties of beets–the bright orange or candy stripped red…but I’ve always been drawn to the dark purple varieties because I think they create the most stunning dishes. Prepare the cashew cream by draining the soaked cashews. Place the cashews in the bowl of a high speed blender with the rest of the ingredients. Blend on the highest setting possible until the mixture is completely smooth and creamy. Add more water, 1 tablespoon at a time, until you reached the consistency of a heavy whipping cream. Pour about 1/2 of the cashew cream into a jar and leave the remainder in the blender (you’ll be adding the soup to the blender to blend with the leftover cream. Heat the olive oil in a large heavy bottom skillet over medium heat. Add the leek and onion and cook, stirring often until they begin to brown and become fragrant, about 10 minutes. Stir in the beets, spices, salt and pepper and continue to stir. Using kitchen twine tie together the bay leaf, thyme sprigs and parley sprigs. Add the water to the pot along with the bundle of herbs and bring to a boil. Reduce heat and simmer the soup until the beets are tender, about 30 minutes. Remove from the heat and remove the herbs from the soup pot. Carefully transfer the soup to the blender with the remainder of the cashew cream. Blend on high until the soup is smooth and creamy. Return the soup to the pot and keep it on low heat for about 10 minutes to allow all the flavors to meld together. Taste test and adjust seasonings as needed. If the soup seems to thick add a touch more water. Serve warm with a dollop of more cashew cream and crusty bread.